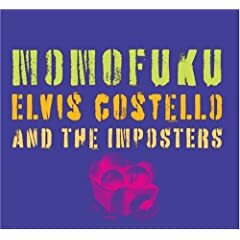 Elvis Costello's new album, Momofuku is at teh top of my shopping list this week. Named after the inventor of the cup noodle, Momofuku Ando, the album is the strongest effort from one of my favorite singer-songwriters in years. Even though the mainstream media is fawning over new albums by Clay Aiken and Neil Diamond this week, there are plenty of other worthwhile releases. From what I have already heard I can strongly recommend Animal Collective's Water Curses EP, The Long Blondes' Couples, Matmos' Supreme Balloon, The Morning Benders' Talking Through Tin Cans, Pattern Is Movement's All Together, and ((Sounder))'s Good Things Come and Go Like Bad Things. Among notable reissues, Spoon is releasing its indie classic Girls Can Tell on vinyl, as are Simon Joyner with Cowardly Traveller Pays His Toll and Man Man with Rabbit Habits.